When skimming through the list of restaurants participating in NYC Restaurant Week, Locanda Verde popped out at me. My bf has mentioned that it's his favorite restaurant in New York, so once I sent their restaurant week menu to him, he immediately agreed to go and made a reservation for us. Opened in the spring of 2009, Locanda Verde has been talked about often. People rave about the food (especially the sheep's milk ricotta), and The NY Times awarded the restaurant 2 stars. After having lunch here, I wholeheartedly believe that Chef Andrew Carmellini's food lives up to its expectations. The NYC restaurant week offering is 3 courses for $25 (lunch) and $38 (dinner), from January 14th to February 8th. (For the full list of restaurants, check out nycgo.com). The prices in brackets below are to show how much those items are on the regular menu. The rest of the prices are for items not included in the restaurant week menu and had to be paid for separately. Locanda Verde is situated in The Greenwich Hotel, a rustic and charming hotel owned by Robert De Niro. The restaurant can be entered through the hotel lobby or through the street entrance. Soaring ceilings and windows on two sides of the restaurant offer a very sunlit restaurant. The dark wood, banquettes, and tiled floors make for an intimate tavern-like ambience. The warm complimentary bread topped with spaghetti squash (a type of winter squash) and pecorino paremsan are indicators that you're in for a very good meal. Sheep's Milk Ricotta ($15) with sea salt and herbs. I promise this appetizer is one of the very best you'll ever have. Light and fluffy with just the right amount of olive oil, rosemary and sea salt, it is absolutely addicting and you'll wonder if you should have ordered 2. The thin slices of bread are lightly charred and chewy. 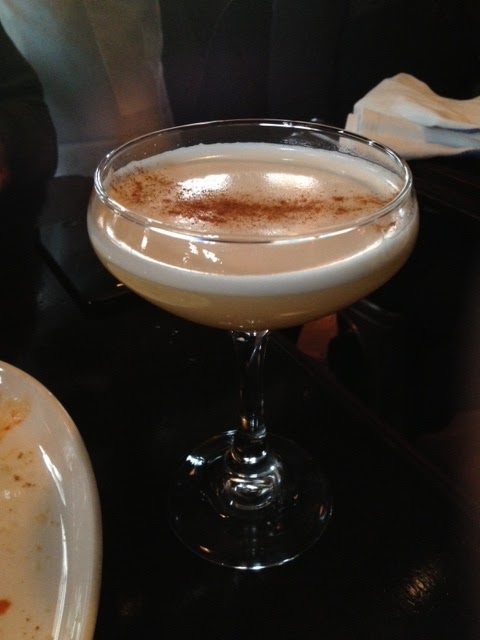 Pera Fresca, $14: Russian standard, pear williams, limoncello, cinnamon syrup, egg white. This pretty drink was light with a hint of sweetness. I liked that it had a refreshing side from the pear and limoncello, while also feeling warm and comforting from the cinnamon syrup. Lamb Meatballs ($14) with caprino and gremolato. Great, but not out of this world. We wished we had ordered the marinated beets with ricotta, almond and herbs instead. Roasted Brussel Sprouts, $9: with pancetta and pecorino. My bf and I are big fans of brussel sprouts. They're probably my most frequently cooked vegetable at home, but I am so glad we got this-- the sprouts were roasted into an incredibly soft texture. The pancetta was a great addition too! Wood-Fired Pork Loin, ($25): A substantial secondi, the pork was deliciously seasoned and satisfying. Fire-Roasted Garlic Chicken, ($25): This chicken was impossibly moist and tender, and served with roasted vegetables. Every single piece of meat was flavorful. I would order this again in a heartbeat. Maple Budino ($11) with cranberry sorbetto and candied pecans: An Italian maple syrup pudding, this was one of the most unique and outstanding desserts I've had. The tartness of the cranberry sorbet complemented the sweet pudding perfectly, and the candied pecans were superb. Nice place you got here very cozy. The menu is great and affordable. I will pay a visit sometime soon.